This world-renowned icon dominates the Quebec City skyline with its unique architecture. 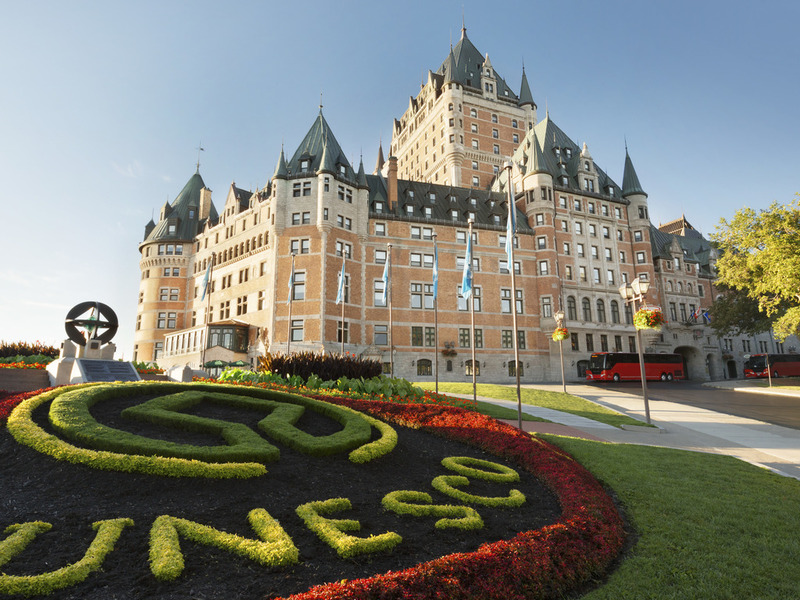 Ideally located inside the walls of Old Quebec, the landmark luxury hotel has undergone a multimillion dollar renaissance project that has repositioned it as one of the world's leading hotels. The restoration blends the charm of the hotels enchanting past with modern innovations, creating an allure that is fresh and seductive, balanced with the hotels rich history and dynamic future. This heritage urban resort will seduce you with its breathtaking views of the St. Lawrence River and the architecture of the Old fortified City, designated a UNESCO World Heritage Site. Discover the best view of the St-Lawrence River or the architecture of Old Quebec City. Fairmont Le Chateau Frontenac is Canada's most beloved hotel. In any one of our beautifully furnished accommodations including 611 guestrooms and suites, you will feel an elegant touch of historic Europe. Our accommodations offer an unparalleled level of luxury and service. A culinary journey through the discovery of a new Québec cuisine by Chef Stéphane Modat. Old World cuisine meets the New World. Come discover and explore the new frontiers of our celebrated regional cuisine. Located on the Dufferin Terrace, Place Dufferin awaits you in a relaxed and elegant setting with an incomparable view of the St-Lawrence River. This restaurant offers sumptuous buffets and "à la carte" menus for breakfast. Located on the terrace level at Fairmont Le Château Frontenac, Starbucks is your perfect stop before a busy day exploring and touring Québec City. Gourmets on-the-go will enjoy a variety of fine sandwiches, salads and pastries. An experience in constant evolution throughout the day. Lunch menu, creative dishes to share, trendy happy hours, innovative mixology and evening entertainment. Inspired by the year of Quebec City's founding, 1608 Wine & Cheese Bar offers one of the largest varieties of top Quebec cheeses in Canada, sourced from its unique Cheese Room, and coupled with the top wine offerings the world has to offer. 휴식 차 방문한 퀘벡에서 2박3일을 이 호텔에서 지내기로 선택한 건 최고의 선택이었습니다. 서비스, 청결도, 방의 안락함 등 모든 부분에서 만족스러운 호텔이었습니다. 룸 시설도 좋았고, 관광지를 둘러보기에도 최적의 장소였어요. 강전망 디럭스 룸이었는데 정말 간신히 강이 보이는 층이라 좀 실망했다. 이런 뷰를위해 추가금을 냈나 하늠 기분이 들고 다음엔 그냥 일반룸이 낫겠다 싶었다. 그 외엔 완벽했다. 투숙한 것에 대해서는 그다지 만족스럽진 않았다. 정말 좋은 위치의 아름다운 호텔임은 분명하다. 하지만 투숙해본 결과는 그다지 만족스럽지 못했다. 투숙인원이 5명이었고 12쯤 체크인을 하러 갔을때 100달러 추가 비용을 내면 준비된 업그레이드된 방을 줄수 있다고 하였으나 사실상은 기다려야 했고, 가장 중요한건 추가 비용을 내고 업그레이드한 방의 히터가 고장나서 직원을 불렀으나 직원은 문제해결을 했다고 생각하고 갔고, 결국 우리는 히터가 고장난 상태로 추운 밤을 보내야 했다. 연말연시라 그런지 전반적으로 그다지 친절하다는 느낌을 받을 수 없었고, 여러나라 여러호텔에 숙박을 해본 경험으로 이 페이몬트 호텔은 겉에서 보는 것만큼 가격대비 만족스러움, 또는 장점을 느낄수가 없었던 호텔이었다. 주변의 작은 호텔의 만족도가 훨씬 더 컸다. 호텔측에서 업그레이드 비용 100달러외에 내가 잘 이해할수 없는 19 달러를 추가로 청구했는데 영어가 서툴은 나는 아직도 그 돈에 대해 이해하지 못하고 있다. 따로 알아 봐야겠다. 호텔 문 앞에 서 있던 벨맨들의 인상 안좋았다.그들은 무거운 짐을 가지고 손님이 차에서 타고 내릴때 그냥 보고 자기들끼리 수다 떨었다. 체크인 데스크 여자 직원은 친절했고 방이 준비가 안되어서 짐을 맡겨두고 주변을 둘러보고 다시 호텔에 들어갔을때 방으로 짐을 가져다 주었던 직원은 매우 친절하게 방 이용에 대해 설명해 주어서 처음 있었던 도어맨에 대한 나쁜 인상을 잊을수 있었다. 비록 출장이라서 호텔의 곳곳을 살펴보지는 못했지만 매우 만족스러운 호텔입니다. 고풍스러우면서도 멋진 풍경을 간직한 곳이었습니다. fairmont 계열은 이미 서부 Victoria에서 한번 자본적이 있는데 물론 거기도 화려한 외관과 분위기는 못지 않지만 방은 너무 평범했는데 (delux 룸) 이번 퀘벡의 Chateau Frontenac은 생각보다 객실이 방이 꽤 넓고 잘만해서 만족했습니다 (Double Double Riverview) Like many other Fairmont hotels, it has exellent appearance. In addition to that, at this time, the room was spacious and comfortable enough. 위치도 너무 좋았고 모든게 최고였습니다. 전망도 너무 좋았고 까칠한 제성격에도 침대 욕실 완벽히 깨끗하고 좋았습니다. 위치도 정말 최고!! 다시가도 무조건 또 가고싶은 호텔입니다. 캐나다 여행 자체도 즐거웠고 퀘벡이 너무 예뻐서 더 즐거웠는데 2박을 페어몬트 호텔에서 묵게 되면서 오점 하나 없는 완벽한 여행이 되었습니다. 영어도 불어도 못해서 어설픈 대화였지만 모든 직원이 친절했습니다. 또 퀘벡으로 여행을 가게 되어도, 혹은 다른 나라를 여행하게 되어도 믿고 또 다시 선택할겁니다. 가격대비 가성비가 좋지 않습니다. 기본적인 샤워가운 슬리퍼조차 없는 호텔일줄은 상상도 못했네요. 다시 퀘벡을 간다고하면 절대 묵지 않을 것 같습니다. 원래는 날짜 변경이 안되는 조건이었음에도 불구하고 비행기결항으로 당황해하는 제게 숙소 날짜를 변경해주었습니다. 저를 반갑게 맞이해줬던 프론트에 emylie에게 특별하게 감사의 말을 전하고 싶습니다. 그녀로 인해 제게 퀘벡은 따뜻하고 친절한 특별한 장소가 되었습니다.